Tewkesbury Abbey was consecrated in 1121, but according to "The history of Tewkesbury" by James Bennett in 1830, it was reconsecrated in 1471 after fighting during the battle of Tewkesbury in that year spilled over into the church "... it having been polluted with blood." The impressive tower is the largest surviving Norman tower in existence, measuring 46ft (14m) square, and 148ft (45m) from its base to the tips of the pinnacles. Originally a lantern tower letting light into the church below, stone vaulting was added in the late 14th C. At one stage the central tower had a wooden spire, but this collapsed in Easter 1559. 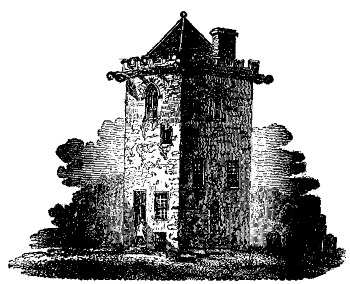 It is not known what bells were in the tower at this stage, but records show that in 1390 a detached campanile was built in the churchyard, and a drawing of it is found in James Bennett's book of 1830 (p130). 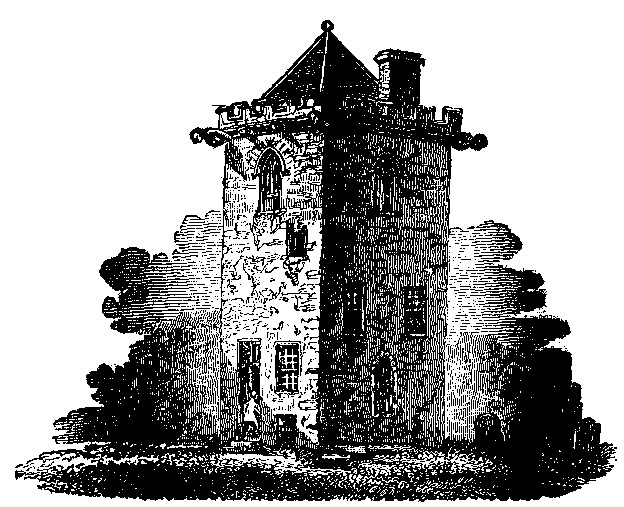 "Until within a few years, a large quadrangular tower, of considerable height, stood in the church-yard, on the spot where the national school has since been erected, and which had been used for upwards of two centuries as the common gaol of the borough. This edifice is supposed to have been the campanile or bell tower; for at the time of the construction of our early churches, bells were not placed in the central tower, as at present, but in an edifice frequently built at some distance from the church. There were several large rents or fissures on the west side of the building, which were probably caused by the too powerful vibration of the bells, and this might have occasioned their being removed into the central tower at an earlier period than they otherwise would. To each of the four corners was affixed a winged female figure, carved in stone; these were supposed to represent evil spirits, in the act of flying away from the "harmony of the steeple" to which, according to the laws of demonology, they were supposed to have a great aversion." In 1539 when the monastery was dissolved, there were 8 bells which cost the parish £142 when Henry VIII sold them. 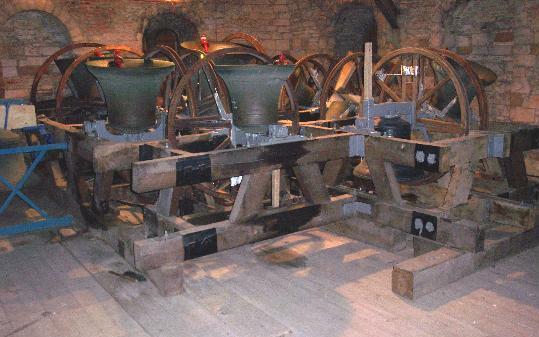 By the early 1600s, there were only four bells, but in 1612, an extra treble was added. The Register of Baptisms for 1607-1629 has the following. Made us that bell which wee ringe before. Which men for that good deede; praie we that they maie thrive. The 24th Julie Anno Dom 1612. For making us foure, being once made five. The bells were finally augmented to six in 1632, again by an unknown founder. The active founders in the area at this time were John Pennington of Monmouth (who cast bells for Charlton Kings in 1630 and Badgeworth in 1634), Roger Purdue of Bristol (Gloucester S.Nicholas and S.Mary de Lode 1636), or Thomas Hancox of Walsall (Swindon Village 1630). In 1696, the bells were recast and augmented to 8 by Abraham Rudhall of Gloucester. This family founding business lasted from 1684 until about 1835, and they cast about 5000 bells over the years. Two of the bells cast in 1696 still exist and are now used by the clock. Most of the other 1696 bells were recast over the years by the Rudhalls, one (the former 10th) lasted until 1962. In 1837, the eight bells were taken to the Gloucester foundry which was now owned by Thomas Mears, who had bought the business after John Rudhall went bankrupt. The tenor was recast at this time. A local builder, James Cull, built a new timber frame for eight bells, and a new ringing chamber floor was built using some of the original timbers about 25ft higher in the tower. The previous ringing platform sat on the 14th C stone vaulting, and indeed some easily recognised changes can still be seen carved on the wall at this level. The bells were augmented to ten in 1914 by Mears and Stainbank of London, the new bells being hung on cast iron "slab" frame castings. However, these bells only lasted a couple of decades, because when John Taylor of Loughborough augmented the bells to 12, these two 1914 bells were recast. Because the bells were somewhat of a mixture, the overall effect was somewhat disappointing, so in 1962, the whole ring was recast by Taylors of Loughborough. The old tenor certainly was a bit on the thin side, since the new tenor (27-1-5) is also in the key of D.
The inscriptions of the old 5th and 10th bells are copied in fascimilie onto the new bells.The bells have modern cast iron headstocks and all run on self-aligning ball bearings. They are hung in the NE corner of the tower, and the ringing chamber is partitioned off from the rest of the tower. This page was written by David Bagley. To have a look at my other home pages, click HERE!